As one looks down the street from the Exchange District in the City of Winnipeg, Manitoba in Canada, the Hotel Fort Garry and the Royal Crown Revolving Restaurant are prominent features. Skyscrapers tower above the traffic which whizzes up and down this busy city street, all which stop at nearly every light. Situated in the downtown core of the City of Winnipeg near the Exchange District, the Hotel Fort Garry is a historic building which sets a high precedent for other hotels around the city. Designated as a National Historic Site, the hotel has 246 elegant rooms with all the amenities and visitors are ensured of a luxurious stay while visiting the City of Winnipeg. Picture of the street traffic seen from the Exchange District in the City of Winnipeg in Manitoba. ... the Royal Crown Revolving Restaurant, another landmark in Winnipeg which overlooks the city from the 30th floor with a revolving lounge on the 31st floor. An elegant place to dine and enjoy the city in a relaxing atmosphere. 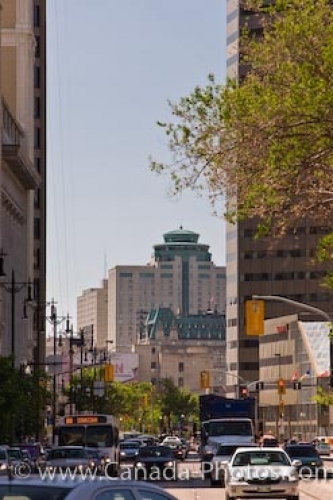 Both the Hotel Fort Garry and the Royal Crown Revolving Restaurant are centrally located in the City of Winnipeg making it easy to wander the street instead of driving amongst the busy traffic. Looking down the street from the Exchange District towards the Hotel Fort Garry and The Royal Crown Revolving Restaurant in the City of Winnipeg, Manitoba, Canada.